Today at cooking class we made multi coloured muffins. Here are the steps of making multi coloured muffins . 3 drops of any colour of food colouring. Step 1 Turn your oven on to 180° for 15 mins. Step 2 Wisk both dry and wet ingredients together. Step 3 Scoop 1 dessert spoon each muffin and top up the rest of the mixture. 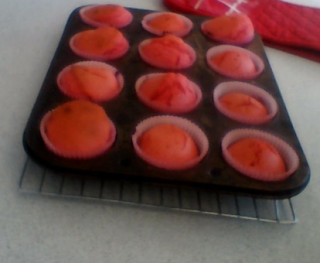 Here is the results of the muffins that we made.